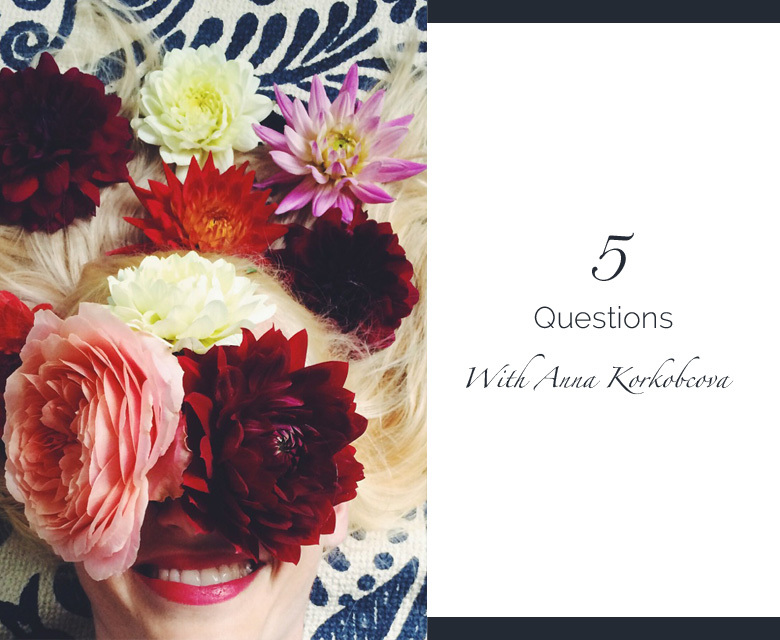 Do you know Anna Korkobcova? Well, you should. I first met Anna more than four years ago when she came to work for me while she was in school at CCA for Interior Design. From the first day she worked with me I could tell she was a special design nymph. She has a strong passion for art direction, editorial concepts, interiors and works in a variety of mediums including my all time favorite…flowers, of course! Her color series, where she overlays flowers on existing images, is not to miss. I admire Anna’s understanding of spacial layout, texture and color, but it is her shining smile and upbeat outlook that makes her bring any room she walks in to a little brighter. I could go on forever as to why I love this talented woman and after you stalk her on-line you will too. 1. What is one aspect of your job that people may be surprised to hear? I think the fact that I work full time as interior designer (both as independent and for Homework) and create my Color Series, art and other collaborations on top of that. I refuse to pick one career over the other so I’m determined to manage doing it all and it’s been interesting, time juggling but overall really wonderful experience. 2. Where do you picture yourself in 5 years from now? Living in New York or Europe, running my own multi-disciplinary studio, working on interior design projects (perhaps hotel one day? ), collaborating with other creative souls and creating Color Series as editorials, partnering with brands and working on other Color Series related pieces I’m already scheming but can’t reveal just yet. It has something to do with giving back through art and design. 3. What is one thing about your current life that would surprise the younger version of you? 4. What trend would you like to see end? 5. If you were to throw a party tonight, what flowers would be on the table? Whatever blooms would be available to create the intimate color mood I’d want to achieve: darker greenery, shades of burgundy, deep fuchsia and hints of sorbet orange, maybe chocolate cosmos for extra touch.